Authority: C. glaucum (Sm.) Hook & Arn., C. menziesii Hook. Description: Tree fern, to 8 m; hāpu‘u pulu hairs/wool are soft, silky & yellowish-brown; hāpu‘u i‘i hairs/wool are coarse, stiff, reddish brown or black birstles. Habitat Cibotium menziesii in moist and rain forests (305–1830 m) and C. glaucum in dry to damp forests up to 1830 m (Valier 1995:52–53). 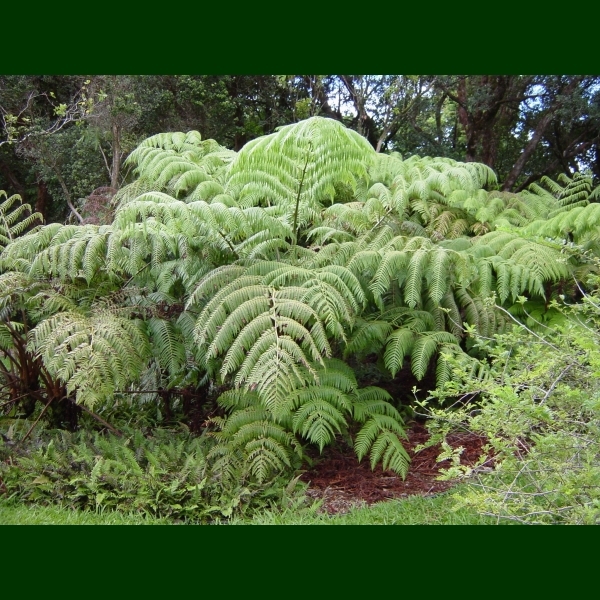 C. chamissoi prefers most potting mix and medium light; C. glaucum is the most commonly cultivated of the hāpu‘u ferns and thrives under medium to high light in moist potting mix or garden soil. C. menziesii also requires medium light and moist potting soil, and needs higher heat and humidity than C. glaucum (Hoshizaki & Moran 2002:245–6). Medicines: Hāpu‘u is used as a "blood purifier" and for returning loss of appetite (ho‘oona i ka ‘ai). 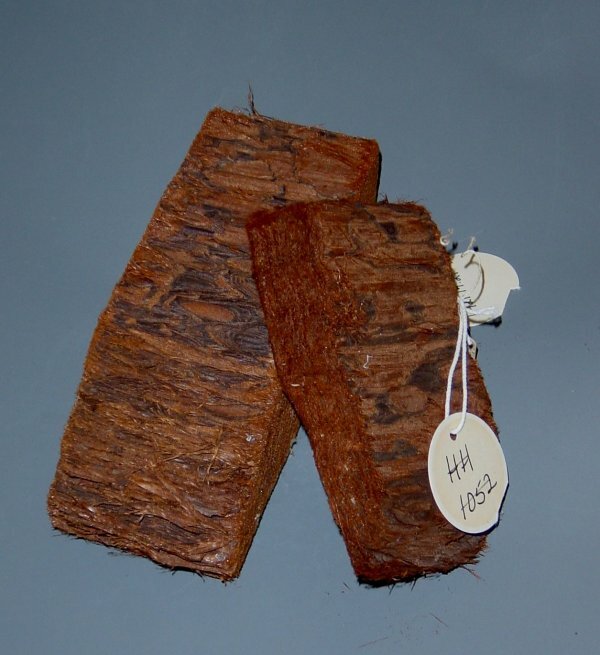 The pith of the hāpu‘u trunk is used in combination with roots of ‘ōolena (Curcuma longa), pawale (Rumex giganteus), and ‘okolehao (made of ki, Cordyline fruticosa). For weak persons (na po‘e koni wiwi‘omali) and some chest pains (ka pa‘a mau o ke ‘ano ‘eha ‘o‘e i ka houpo) the pith of the hāpu‘u is mixed with the pith of ‘ama‘uma‘u (Sadleria cyatheoides), kukui bark (Aleurites moluccana), ‘ōhi‘a ‘ai bark (Syzygium malaccense), ‘ahakea bark (Bobea spp. ), root bark of ‘uhaloa (Waltheria indica), pōpolo (Solanum americanum), ‘auko‘i (Senna occidentalis), noni fruits (Morinda citrifolia), and kō kea (white sugarcane, Saccharum officinarum). For numerous body ailments (stiff muscles, etc.) the treatment uses heated pulu (Chun 1994:81–83). Non Medicinal Uses: The starchy core was cooked and eaten during famine (Handy et al. 1972:234; Krauss 1993:15; Malo 1951:22,43); pulu or fawn-colored silky hairs were used to fill the body cavitiy because it would absorb the body fluids, as a preparation for burial (Krauss 1993:121). Use of pulu in traditional pillows (uluna) not substantiated (Abbott 1992:74). The trunk of a large hāpu‘u could be used to construct a bin for growing uhi (yams) (Handy et al. 1972:179–180). `Ōlelo Noeau: [I] He hāpu‘u ka ‘ai he ‘ai make. If the hāpu‘u is the food, it is the food of death. When famine came many depended on hāpu‘u to sustain life, but it required much work to prepare. The was the cutting, the preparation of the imu, and three whole days during which the hāpu‘u cooked. If the food was done then, hunger was stayed; if not, there was another long delay, and by that time someone may have starved to death. [II] Nui ka ‘ai ma ke kuahiwi, pu‘u no ka ‘ai, ‘i‘o no ka i‘a. There is much food in the mountains, pu‘u is the food and ‘i‘o is meat. This was said by the Reverend David Lyman, a missionary, in 1857 when his pupils went with him to the mountains and complained of having no food for the journey–there was an abundance of hāpu‘u and ho‘i‘o ferns in the mountains. Propagation Information: Grown from side shoots on main trunk & by spores; likes rich, organic, well drained soil & lots of water; grows in full sun/partial shade with lots of moisture; tolerate some saltspray but fronds don't stand well in windy areas; don't dig forest plant (Bornhorst 1996:74–75; Nagata 1992). Hawaiian Native Plant Propagation Database (C. menziesii); Hawaiian Native Plant Propagation Database (C. glaucum).